Piranha Sprouts are Piranha Plants who appear in Yoshi's Story, and only appearing in Stage 4-3: Piranha Grove. Piranha Sprouts are one of the few variations that have the ability to walk. They look like the bud of a Piranha Plant with green shoes (or leaves resembling shoes). Their ability to walk is extremely limited to short waddles. Piranha Sprouts, like Piranha Pests, are able to shrink anything that escapes from their mouth. It makes an odd squeaking sound and pops out of the ground when least expected. The only known way of defeating a Piranha Sprout is by shooting it with an egg. Chūchū Pakkun 「チューチュー」 chūchū is onomatopoeia for the squeaking sound made by mice, etc. (or by kissing); 「パックン」 Pakkun is from the Japanese name of Piranha Plant. ↑ Yoshi's Story official website (Wayback Archive). Retrieved April 22, 2015. 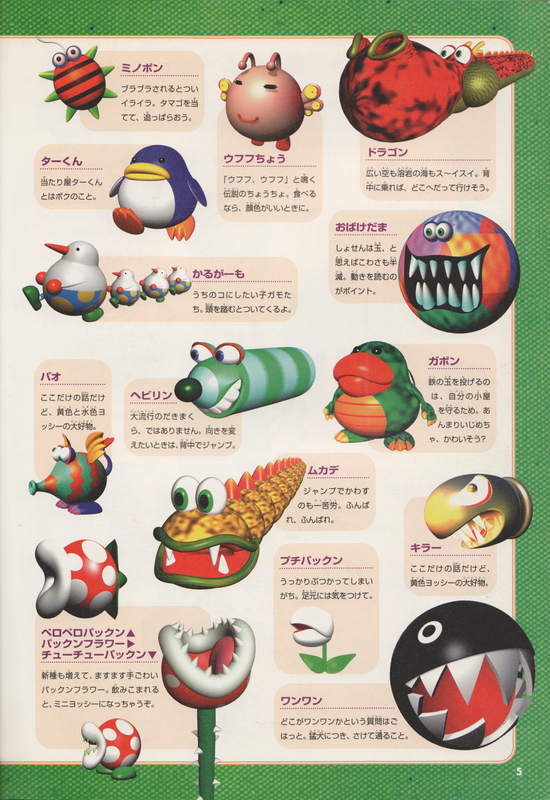 ↑ 「ヨッシーストーリー 任天堂公式ガイドブック」 (Yoshi's Story Nintendo Kōshiki Guidebook), page 5. This page was last edited on February 13, 2019, at 16:40.